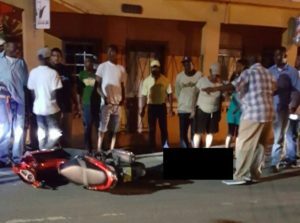 ROAD TOWN, Tortola, VI- A Young Civil Servant last evening became the 2nd Murder Victim in Tortola in less than 24 Hours . The man shot to death close to the Sunday Morning Well in Road Town, the capital city, has been identified as Ashburn A. Dawson aka ‘Ashy’ of Carrot Bay, Tortola. The deceased is a civil servant assigned to the High Court Registry where he worked for a number of years. He is survived by his parents and one son. Mr Dawson is 30 years of age and would have been 31 in August 2017. It is reported that at least three shots hit Mr Dawson and he fell to the ground on the public road. Before the ambulance arrived there were members of the public trying to assist the man; however, he subsequently died at the island’s main Peebles Hospital despite many attempts by paramedics to revive him. In addition, one of our newsroom’s senior sources from the Royal Virgin Islands Police Force confirmed that police has a suspect in mind and is on the hunt for the alleged lone male shooter. There remain over 20 unsolved murders in the tiny Virgin Islands of about 40 thousand residents. The Board of Directors, Management and Staff of Virgin Islands News Online offer our condolences to Mr Dawson’s immediate family and other loved ones.